I work with the natural elements, fire and copper, to create dynamic woven pieces. I focus on creating movement within the weaves by cutting soft curves in the metal. Some works are inspired by the natural environment of the Pacific Northwest, while in other pieces I focus on the flow of the vibrant colors. The complexity and uniqueness of working with these two elements draw me to this medium. I have previously explored pastels, acrylics, pencil and leatherwork during my artistic adventure. During an unexpected life changing event, my path crossed with fire and copper. I became enchanted with the warmth of copper and wildness of fire. Putting aside my leather working tools, I spent countless hours learning to produce the vibrant colors on the copper using heat. My initial work included unique designs, inspired by the Pacific Northwest's landscape, carefully sanded into copper panels. With a desire to make larger pieces, I experimented with thinner sheets to create woven copper and became immersed in this art form. Weaving copper requires quite a bit of precise measuring and initial planning. 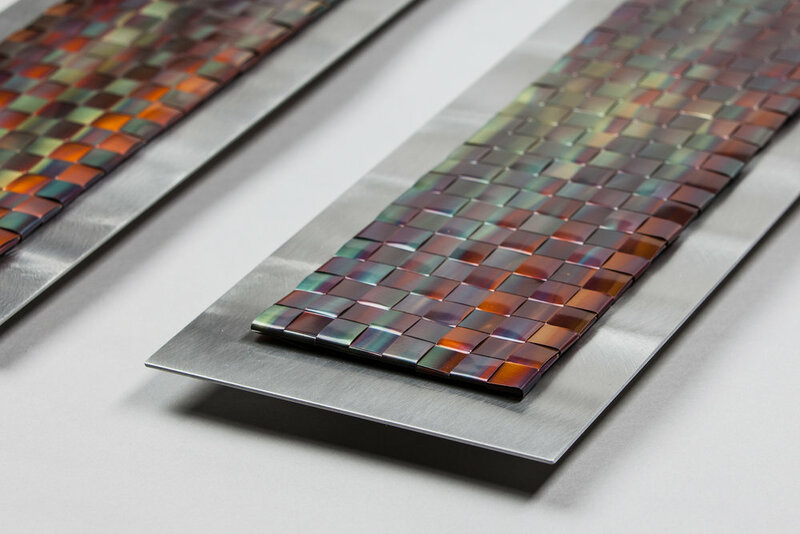 The metal is first heated to bring out the beautiful array of colors. After firing, strips are cut and woven carefully together. A special coating seals and protects the colors from further oxidation.